Welcome to Fabric World, one of the oldest standing fabric stores in the Western Cape, situated in the Southern Suburbs region on the Wynberg Main Road and Northern Suburbs area in Brackenfell. Owned and operated since 1998 at the same location. We are consistently researching the latest fashion trends and travel the globe to bring you the finest fabrics. Fabric World specializes in special occasion, haute couture and designer fabrics from around the world. We carry a full line of laces, silks, linens, 100% cottons, woolens and men’s suiting. We also carry a large selection of buttons, trims and sewing accessories. Our focus is on providing high quality merchandise, service and customer satisfaction. We are pleased to have you visit our site and hope to meet you at our store location soon. 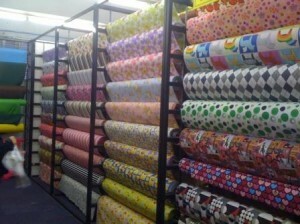 We stock a wide range of fabrics in our stores. It’s impossible to show you all our stock on the website as we are receiving new fabrics every week suitable for curtains, blinds and upholstery. You can see a taste of our selection here, and we invite you to visit our shops in Wynberg or Brackenfell to see our entire range and discuss your requirements with us. We also have special offers on the site so do have a good look round! Take a look at our online catalogue for curtain fabrics, upholstery fabrics, blinds and exclusive silk curtains. If you would like samples, please telephone us on 021 797 6272(Fabric World Wynberg) or 021 (Fabric World Brackenfell) with how much fabric you’ll need. If you’re not sure of your requirements, simply call us or submit your enquiry and we’ll work out the rest. A small piece of fabric is often not enough to show what it would look like when made up into curtains or soft furnishings. So why not visit one of our shops where you can really experience and touch the range of fabrics we offer.